After breakfast we boarded a water taxi to the train station. This was my first experience with the train system in Europe. How very efficient, comfortable, and clean this experience was! As we traveled along the Italian countryside, at first it did not look that different than the views along highway 70 between St. Louis and Kansas City...corn fields, etc. Then, it was apparent that the scenery was changing. Tuscany is beautiful just like the many paintings you have seen of rolling hills and quaint homes surrounded by those tall evergreen trees (cypress?). After we arrived at our hotel, The Excelsior, we were treated to a very interesting introductory art lecture by a Syracuse professor. Lunch was delicious. Debi, our tour guide, told us that the food in Florence is the best. The buffet we had did not disappoint. After lunch we went on an orientation walking tour with a Whisper Guide. We learned about the city and how absolutely lovely it is. The people take great pride in their city. Our guide told us Sienna is the rival city to Florence, and that they hate each other. We go to Sienna on Wednesday. Florence is very clean, in contrast to Milan and Venice (though Venice was cleaner than I thought it would be). The wrought iron lamps on the buildings, the cobbled streets, the gates, flower boxes on windows, wine shops, restaurants, shops...all unique. I am really enjoying the whisper guides. This is where you wear an earpiece and have a transmitter. The guide talks into the mic and these actually have pretty good range. Then, you do not have to stand so close together just to hear what the guide is saying. Very cool. One thing did not change throughout Italy, so far, the cars and Vespas, motorcycles, bicycles will ALL run you down. On our walking tour today, we saw The Duomo from the outside. I would like to see the inside, though our guide said we would probably be let down because the outside is much more beautiful than inside. 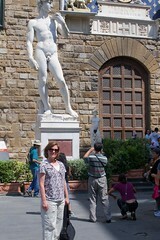 Tomorrow, a tour of Accademia, the Uffizi Art Gallery and lots more. Stay tuned! I am glad you are in Firenze. It is so lovely. You will have a great time at the Uffizi. If you get a chance go to the Palazzo Piti and the gardens. Enjoy the best Gelato at Grome, located by the english bookstore, hidden in an ally off the Duomo. And if you need a drink the Joshua Tree is my watering hole of preference. The Oil Shop has the best sandwiches but they are not really traditional Italian. I liked the inside of the Duomo, but you could skip it, for sure. You get a really neat view of the city from the top and there are these weird passageways you have to go through just to get there. But Auntie Laurie is probably the best guide of Florence you could get, so follow her! Our guide told us about the walk to the top. Did you do that? It is really warm here, right now...in the afternoon. The guide was complaining. Being from St. Louis, it was not too bad. Annie Laurie is more interested in shopping. She left our tour of the city early. We are going to a spot where you get a great view of Tuscany later today. I will take pics, of course.